Exquisite development parcel 20 acres (8 hectares) and 400 meters of beach frontage. The views are among the best that this area can offer. This unique piece of land is zoned for Titled and Concession. The zoning plan for the Maritime Zone is projected to have at least 30% land usage and is currently being obtained. 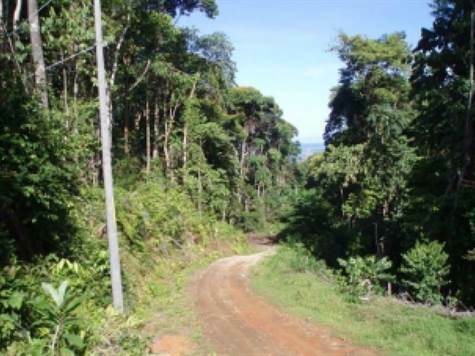 Both titled area (8 acres, 3.6 hectares) and concession area (12 acres, 4.4 hectares) have easy access, large building areas, some forest, electricity, river frontage, water rights, 700 meter trail/easement to a 30 foot waterfall. This property is teaming with wild life, White Faced and Howler Monkeys, Toucans, Parrots, Scarlet Macaws, Sloths. Throughout many months of the year whale watching is amazing as it is one of the few breeding grounds on the Costa Rica Pacific Coast. Playa Escondida is located between Uvita and Ojochal on both sides of the Costanera in the South Pacific Zone. The new to be built "Palmar Norte International Airport" will be located a short 25 minute drive to the south. Currently there is a local airport in Palmar Sur (20 minutes drive south). The towns of Uvita and Ojochal are both less then 10 minutes away with a variety of shops and restaurants.